It’s that time of year again. The Nordstrom Half-Yearly Sale is back until June 3, 2018 and you can get certain items up to 40% off! I have been loving so much stuff on the website recently and I wanted to share with you all some of the things I am currently loving. 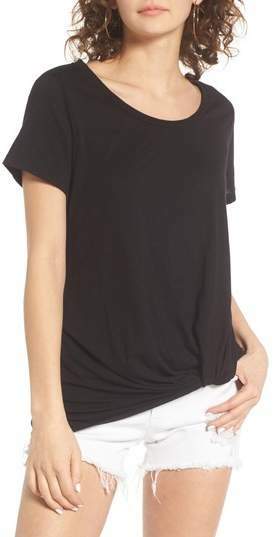 I am loving this twist front tee for casual wear. It’s perfect for wearing with jeans or shorts and a pair of cute sandals or slides. This top comes in black, gray, white, and green and is less than $14 with the sale! I bought this maxi 2 years ago in navy blue and I seriously love it! I wore it the last time Justin and I cruised to the Caribbean and it was a perfect outfit of casual elegance. It’s now under $40 with the sale! I have been eye-ing these sandals for a while now! They’re on sale for $50 and are 37% off. I think these are the perfect classic muse sandal for any occasion and will be one of my go-to faves for a long time! This spring and summer is definitely being taken over by the ruffle craze and I am 100% okay with it. I love the subtle ruffles and classic lines of this dress! It’s perfect for date night, cocktail parties and wedding receptions. It comes in other colors such as black, blue, coral and red! It was originally $88 and is now under $55! Another perfect dress just in time for wedding season! I love this shade of pink and the ruffles at the shoulders and hemline are the perfect size. This outfit was originally almost $90 and is now under $45! I’m always on the market for a cute sweatshirt for those cooler summer nights! The reviews say that these do run small so I would size up. Also, the description says that it “skims the waist” so I feel like these would be a modest yet stylish take on the original sweatshirt! It’s also originally almost $40 and now they’re under $20.